U.S. horse racing has an increasingly worsening reputation regarding the treatment of its racehorses chiefly because of the egregious use of illicit drugs and the tragic stream of breakdowns and deaths of racehorses. A recent trend is the alarming number of breakdown and deaths of racehorses as young as two and three during training before they ever make it onto a racecourse. See Patrick Battuello’s site “Horseracing Wrongs” for details. Some attempt to point out that not all horse racing is as evil as what goes on in the U.S., that in other racing jurisdictions around the world they train and race their horses in a cleaner, more ethical fashion whose horses consequently suffer fewer breakdowns and death. That may well be true. However, whether this is factual in whole or in part, there is one issue that all of horse racing has in common and it is this — the slaughter of its racehorses. Jane Allin is unrivalled in her research and reporting on horse racing in N. America. Several years ago, Allin wrote a report called “Racing Through the Slaughter Pipeline” which we have published on our website. We republish below Part 1 of “Horse Racing Through the Slaughter Pipeline” entitled, “Food for Thought”. We invite you to read further than Part 1 via the links provided following this excerpt to get an insight into the bloodiness and death endemic to the so called “sport” of horse racing. 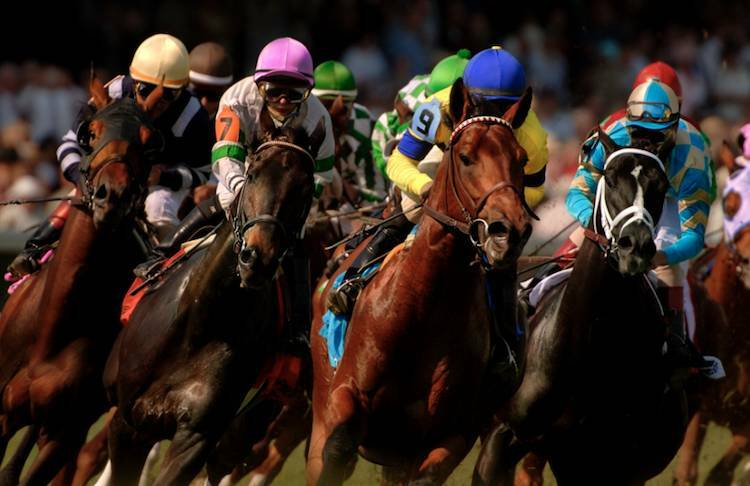 For decades horse racing has been touted as the “Sport of Kings”, resplendent with charismatic beauty, energy and awe-inspiring competition of humankind’s most celebrated and noble companions. What once began as a sport that captivated the masses in pursuit of exhilarating recreation and honed the excellence of horsemanship required in battle has now become but a mass-producing genetic assembly line in an absurd quest for racing excellence fueled by greed. The consequences of this development are not pretty. The multi-billion dollar racing industry cultivates the fallacious impression of retired racehorses living lives of luxury, grazing in fields of Kentucky bluegrass, serving as pampered family pets or well-provided-for riding horses and the like. In reality the vast majority of thoroughbreds (2 out of every 3) coming off the track, regardless of their health, are either euthanized, abandoned or slaughtered for their meat. Only a small number of the whole are considered good enough for breeding which is primarily reserved for only the best in the industry. For thousands of Thoroughbreds that do not make the grade, whatever the reason, the end is both terrifying and brutal. Intentional or not, the horse racing industry now subsists as a principal tributary of the slaughter pipeline ― a confluence where magnificent bloodstock race for their lives toward the equine version of the river Styx ― the river that separates the world of the living from that of the dead. Two former U.S. horse racing stars who met their deaths in foreign slaughterhouses drew major attention to the fact that racehorses were being slaughtered not only abroad but also at home. They were Ferdinand and Exceller. Ferdinand was slaughtered in Japan and Exceller was slaughtered in Sweden. Victories in the 1986 Kentucky Derby and the 1987 Breeders’ Cup Classic figured to have earned Ferdinand a cushy retirement when his racing days were over. Instead, his life apparently ended in a grisly manner, in a Japanese slaughterhouse in 2002, according to the racing industry trade magazine The Blood-Horse, which will report his death in its issue dated July 26. It is believed that his carcass was used to make pet food. The Exceller Fund tells us this about the brutal and terrifying end of Exceller’s life, handed over to meet his grisly fate by someone he had bonded with and trusted. Best remembered as the only horse to beat two Triple Crown winners, he [Exceller] proved his quality on a global scale by winning graded or Group 1 stakes on both sides of the Atlantic. Exceller stopped being Exceller when breeder interest waned. At that point, he became just another horse. His final destination was similar to that of an estimated three million American horses from 1986-’96. Anne Pagmar, who led him to slaughter, said Exceller knew what was going on. He smelled blood and expressed fear. Tied off and hung by a single hind limb, fractious horses thrash while their executioners bludgeon and bludgeon. They are alive when their throats are cut and they are bled to death. Not everyone has grown cold. Christine Picavet galloped horses after coming to America from France, and one of those horses was Exceller. She went on to become a noted artist and she painted the horse twice. She still bears the scar of a playful bite. When she heard Exceller’s story, she struggled for words describing his generosity and kind disposition. Then, in tears, she apologized, begged for time to compose herself and put the phone down.